We are returning to Chipping Sodbury near Bristol for our next meet but this time we will be in the presence of Stephen Jones of Checkmate. 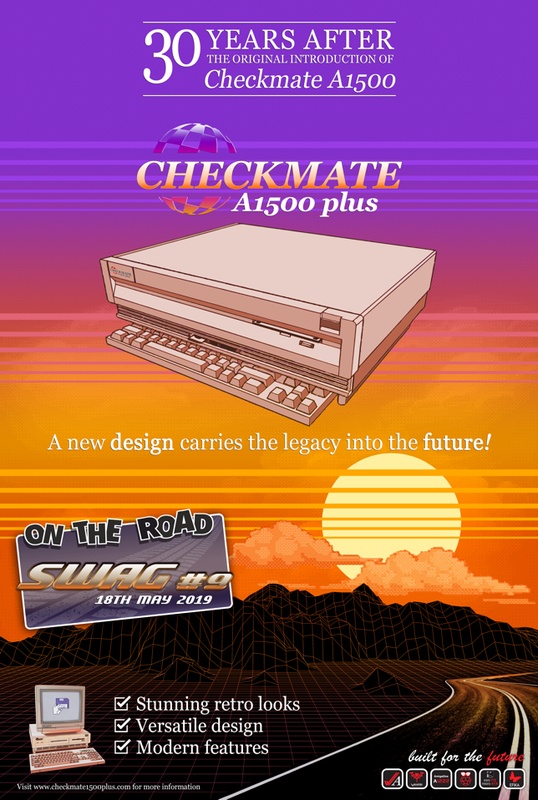 30 Years after the original introduction of the Checkmate case, Stephen is now putting his finishing touches to his latest creation following a successful Kickstarter campaign that will bring a new highly configurable case for your existing Amiga. Follow the progress on his website or come and see the new case for yourself at SWAG #9. Stephen has also very kindly sponsored the event and covered all room hire costs. If you see him on the day then please do say “Thank you”. He, more than anyone else, has made the day possible. The event is being held at Dodington Parish Hall, Chipping Sodbury, on Saturday 18th May, and runs for a whopping 12 hours from 10am to 10pm. 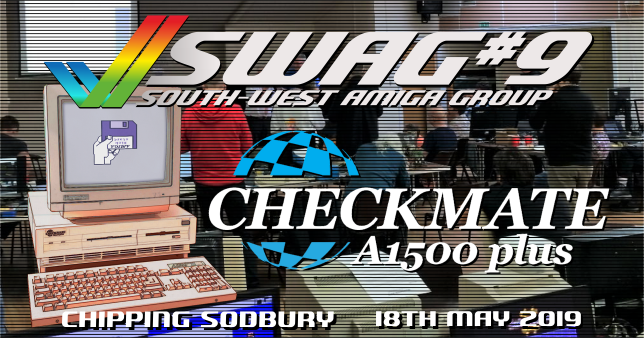 Along with Stephen’s case unveiling we’ll have our tech team on site upgrading and repairing classic Amiga hardware, mod tracker demonstrations, Deluxe Paint tutorials, game tournaments and much more besides. 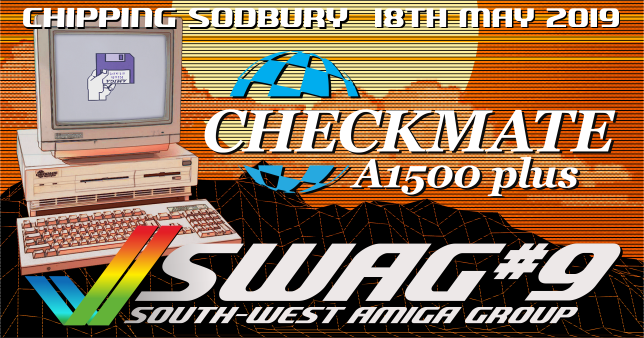 If you haven’t been to a previous SWAG all day event then this would be a great time for you to come along. Since we have been growing rapidly, we’ve decided to set up a booking system so you can reserve a table. The booking system will open at Saturday at 6pm UK Time, so get your order in sooner rather than later. Tables are limited! If you just wish to attend but do not require a table then you will still be very welcome. Regardless of whether you’re booking a table or not, the attendance cost is £5.50, to be paid in advance. This covers the cost of lunch, snacks, soft drinks, tea/coffee and disposables. Under 18s accompanied by a fee paying adult are free, but do let us know you’re bringing them so that we have an idea of numbers and know how many sandwiches to order for lunch. We welcome you to attend the next SWAG meet at Dodington Village Hall on Saturday 18th May 2019 between 10am till 10pm. If you are bringing a computer then we ask you to ‘book’ your table below as we are expecting many Amigan’s who will be coming to see Checkmate’s presentation also. If you are bringing a friend / partner who is over 18 years old and you’re booking a table then please book them a seated ticket, also. Children under 18 years of age, accompanied by an adult are free, but please mention in the order note that you will be bringing them along. This will help us gauge numbers. We are a non-profit group and all our monies that are raised will be put back into the running costs of this event or future events. Book your table at £5.50 which reserves your table and includes food. If you do not want a table please reserve a seat, also priced at £5.50. Your admission price covers room hire, snacks, soft drinks, tea/coffee, etc. Chris Forrester on Workbench: Our First Ever SpeedBall 2 Prize Tournament.